I was diagnosed with barretts Oesophagus about a year and a half ago following an endoscopy. Immediately after my endoscopy I got severe heartburn. i had never had a day of it prior to the endoscopy. Since then i have taken 40 mgs of Esomeprazole a day and I am not having any heartburn or any other symptoms. But for the last six months I have been bringing up blood in my saliva. Usually worse in the morning but can continue all day. I have seen my GP who sent me to an ENT doctor who put a camera down my throat (through my nose) he said it was sore and a bit "refluxy" - his word - but other than that my throat was ok. I have also done a swallow test and was told all was ok. So then why am I bringing up this blood? Has anyone with barretts had a similar problem? Is it part of the reflux problem or is it something differnt? I am very worried mainly because I cant seem to get any answer to my problem. Nearly 40% of those with Barrett's say they never experienced the heartburn pain of the acid refluxing that caused it. Thier oesophagi must be less sensitive. Barrett's cells are also less sensitive than the squamous ones they replace so many who did feel heartburn, don't once the Barrett's has developed. 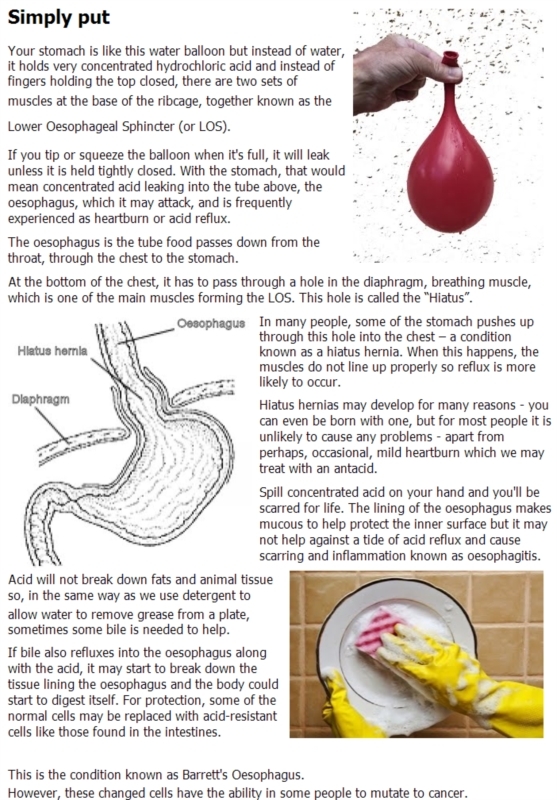 It is possible you have some oesophagitis which is bleeding? It doesn't need much to show in saliva. Or is it actually from mouth or throat? Thanks Barretttts for your quick reply. No the bleeding is definitely not from my mouth or gums as I have had that checked. Regards my throat I have checked it out with an ENT specialist who said everything with my throat was okay. Could I get so much bleeding from oesophagitis? it has been going on for months now and some days it can be for quite some time and the blood just comes up with my saliva. I dont have to cough to bring it up. Do you think this could be because of the PPI I am taking - Nexium? Should I maybe try another PPI? Unlikely the Nexium would cause bleeding. PPIs reduce acid and let any erosion heal but there are other PPIs you could try. If you had a following endoscopy which you say you had, then I do not see any reason why the blood would come from your esophagus? The specialist would have seen some erosions and therefore you could make a conclusion based on your esophagus. How is your stomach doing, do you have any erosions there? Otherwise the bleeding must come from your gums or some area in your mouth or maybe from your nose down to the month. If this persist, visit a mouth, nose, ear specialist. I've read dozens of PPI's stories (eg. Nexium) but never have heard that a PPI class drug could cause a bleeding. Hi Esic - No I have not done a follow up endoscopy. I saw an ENT specialist who put a camera up through my nose to examine my throat. i am not sure what they call it but it is not an endoscopy where they sedate you and check out your intestinal organs. They only look at your nose (nasal passages) and your throat. My stomach according to my last endoscopy was doing fine and the only problem was in my oesophagus. O sorry, so you went to your ENT specialist and your previous endoscopy was fine. That’s really awkward. I really don’t know what It could be, are you sure that your gums are fine? Anyway, I believe that Nexium doesn’t play a role here (based on what I’ve read in the last couple of years). Perhaps a pulmonologist...a lung specialist. Hi Sobhan I am all good now. The bleeding has stopped as mysteriously as it started. I never was able to find out what caused it but I haven't had any pbleeding for 6 months now. Also the lump in my throat feeling has gone. I am still taking my PPIs - one in the morning and one at night and I have raised my bed so I dont know if all of this has made the difference but happy to say I dont have anymore of it. Around 2 years ago I had exactly the same symptoms as you with regards to blood in saliva. I was prescribed Omeprazole by my GP, 20mg to be taken twice daily. The symptoms continued for a few weeks and then promptly disappeared. That is until a few weeks ago when I tried to reduce my dosage due to the many poor reports with regards to the negative effects of long term usage of ppi's. I noticed that if I didn't take the tablet before bed, I would have blood in my saliva the next morning. I do not cough at all just spit and there is bright red blood in my saliva. There is not a lot of blood (it looks more than it is due to spitting into a white sink) and there is no blood the rest of the day just in the mornings. However when I take the pill before bed, there is no sign of any blood at all. My concern is that the Omeprazole is merely masking an underlying issue in either my oesophagus or stomach which has been present for the last couple of years. i am experiencing the same blood in saliva issues as yourself. i have been told by a Barrett’s nurse that the bleeding is unlikely to be Barrett’s related and maybe from a second prescription drug I am taking called Lymecycline for acne. i shall return to the doctor next week to discuss but did you have any more feedback? i am experienc exactly the same issue re Barrett’s and Blood in saliva. Do you have any advice you could offer me? Hi Chris, You could check with your doctor if it could be due to Helicobacter Pylori and do an endoscopy with Biopsy or tissue testing from antral stomach if you are having Acid Reflux. Also, check your acid level, probably it would be low.